Pass the Turkey, a take on Hot Potato, is a super fun, low prep Thanksgiving game that will get everyone moving and laughing. It’s somehow become the norm that we play games for holidays. I think it started with me doing a large majority of the games for the kids’ class parties over the years and now they expect games even when there is a not a class party. Our kids love playing Pass the (fill in the blank with whatever fits the holiday/season) and request to play it for every holiday. We use a pumpkin at Halloween and a gingerbread person at Christmas. This Thanksgiving game is a take on the popular Hot Potato game in which players pass a small object such as a ball or a bean bag around until the music stops. Set up for this game is so easy. All you need are players to play the game, music, and a stuffed turkey (a toy, not the one you are going to eat 😉 …super easy! 1. Instruct the kids to form a circle facing each other. They can either stand or sit in a cirlce. 2. 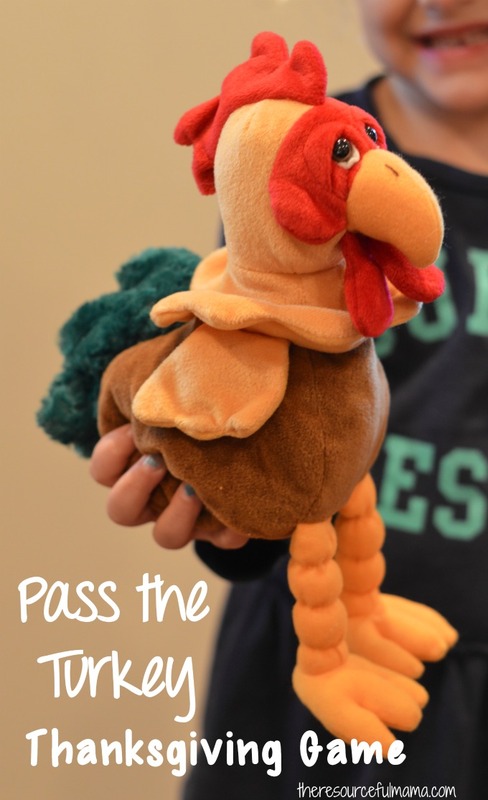 Hand the turkey to one child and instruct them to pass it (nicely) to the person next to them when the music starts. Players continue to pass the turkey to the player standing next to them until the music stops. 3. The player left holding the turkey when the music stops is eliminated and sits out. 4. The music starts again and plays continue until only one person is left standing.